Compare the map to the numbers and letters. 1. Egyptian civilization, 4000 BCE. People began settling in villages to farm near the Nile River. Over centuries, these villages grew into the civilization of ancient Egypt, one of the greatest river valley civilizations of human antiquity. 2. Nubian civilization (Sudan), 6000 BCE. People settled in this area south of Egypt even before the Nile River was settled. The greatest Nubian kingdom was called “Meroe,” and it thrived from about 500 BCE – 400 CE. Meroe was destroyed by rivals, named the Aksumites, who lived to the southwest. 3. Bantu Migrations from West-Central Africa, 1000 BCE to 1500 CE. Groups of people speaking Bantu languages began to migrate out of West Africa to eastern and southern parts of the continent looking for new land. They brought farming, herding, and iron tools with them to regions of Eastern and Southern Africa. 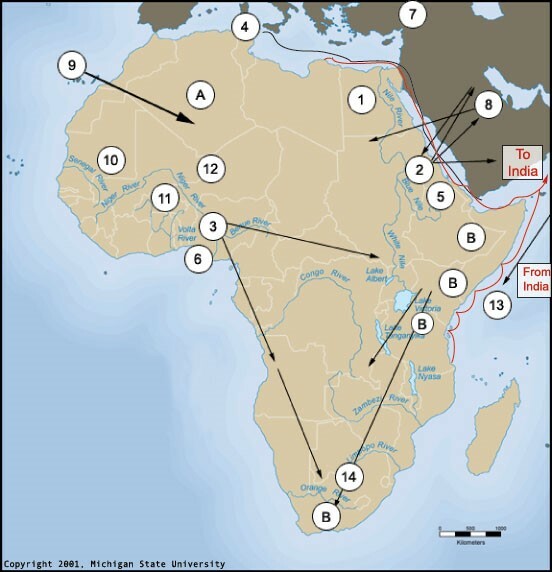 The arrows indicate Bantu migration. 4. Carthage (in present day Tunisia), founded 9th century BCE. This great city of antiquity was located on the north coast of Africa by the Phoenicians of Tyre. It is now a residential suburb of the city of Tunis. The architecture in Carthage exhibits Africa’s link with the Mediterranean world. The city was destroyed by the Romans around the 2nd century BC. 5. Aksumite civilization (Ethiopia), 500 BCE to 700 CE. Aksum, located in present-day Ethiopia and Eritrea, had a trade network that stretched from the Mediterranean Sea to India. Christianity travelled to Aksum along these routes, and it became the center of the early Ethiopian Coptic Christian Church. The red lines indicate Aksum trade routes. 6. Nok Culture (Nigeria), 900 BCE to 200 CE. It is one of the most well known West African Stone Age cultures. Artifacts found from Nok culture include clay figurines of animals and stylized human beings, iron tools, stone tools, and stone ornaments. 7. Christianity, 1st century CE. Christianity traveled to Egypt and was introduced to Aksum along trade routes that connected it with the Greco-Roman world, including parts of Southern Europe, Northern Africa, and the Middle East. Ethiopia is home to one of the oldest continuous Christian communities in the world. 8. Islam, 7th and 8th century. A group of Muslims, who escaped persecution in Mecca by fleeing to Ethiopia where the Ethiopian King gave them protection, were the first to bring Islam to Africa. The spread of Islam in Africa began with the Umayyads, who brought the religion to the Middle East and to North Africa. Along the coast of North Africa, Islam spread among the Berbers. The Islamization of West Africa began when the ancient kingdom of Ghana (c.990) expanded north into the Sahara Desert. 9. Trade routes in and between West and North Africa have existed for nearly 2000 years. West Africans in the savannah and forest regions had no local sources of salt, but they did have gold. North Africans had no gold, but plenty of salt. Important kingdoms developed in West Africa around trade with North Africa in salt and gold. Three kingdoms were especially important: Ghana, Mali, and Songhai, which are also known as the Sudanic kingdoms. 10. Kingdom of Mali, 1240-1500 CE. The word Mali means “where the king lives.” Mali’s powerful kings controlled both the gold mines of the south and the salt supplies of the north. Mali’s king was called Mansa, which means “emperor.” Mali’s most famous King, Mansa Musa, ruled Mali at the beginning of the 14th century. He is known for basing his laws on the Quran, establishing Timbuktu as a great Islamic learning center, and his pilgrimage to Mecca, which resulted in new trading ties with other Muslims across Africa and the Muslim world. 11. Kingdom of Songhai, 12th to 16th century CE. Located in what is now central Mali, the Songhai Kingdom was one of the largest empires in the western Sudan. The kingdom accepted Islam around 1000 CE. Among some of its significant leaders were Sonni Ali Ber (1464-92) and Askia Muhammad I (c.1493-1528). 12. Trade on the Swahili Coast, 500 CE. Black Africans and Arab traders came to the East African coast around this time and traded with local African peoples. The descendants of these people developed a new language, Swahili, which was a combination of African and Arabic languages. The Swahili were involved in trade to Arabia, China, and India. They carried animal skins, ivory, gold, and other metals to these places. They brought back many goods, including cotton, silk, and porcelain. 13. Great Zimbabwe, 12th to the 15th century CE. Today, ruins in Zimbabwe dated from this period bear testimony to the earliest of the centralized kingdoms of Zimbabwe. It is estimated that the central ruins and surrounding valley (a combined area of some 2.8 square miles) supported a Shona population of 10,000 to 20,000. Their economy was based on cattle husbandry, crop cultivation, and the trade of gold on the coast of the Indian Ocean. Great Zimbabwe was the heart of a thriving trading empire from about AD 1100 to 1500. A. Tassili-N-Ajjer, from mid-6th millennium BCE. This is an ancient site in Algeria where rock-paintings and engravings are now found. These pictures depict what is now the Sahara Desert as a land of open savannah with wildlife that is no longer found in that region, indicating the ecological change that has occurred since that time. B. Early human fossil remains found in various locations in Africa by paleoanthropologists. When you have finished reading about the historical events in Africa, view the timeline and graphic organizer for Map 1, and fill it out with the appropriate information.